Fleming’s Seafood is registered with the Dept. 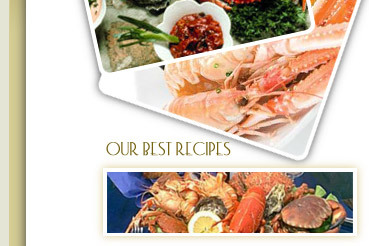 of the Marine and are fully HACCP compliant. Gay and Freda are involved in every part of the business themselves thus ensuring the highest standards of quality and traceability are maintained at all times. Gay is very particular about the quality of the fish he buys. This quality is maintained to the highest standard as it is frozen, once processed, very quickly after purchase. Gay is also responsible for filleting, vacuum-packing, freezing and deliveries. Gay buys all the fish, 85% of which is wild and bought locally in Rossaveal from trawlers fishing on the West Coast. The large plaice and lemon sole are also wild and bought from Iceland as large ones are very difficult to source here in Ireland. Organic and farmed salmon and trout are bought locally. Bass and bream are also farmed and imported from either Greece or France. Freda looks after the Home Deliveries side of the business including ringing customers, preparing the orders and organising delivery times. She also does the accounts and administration for the business.